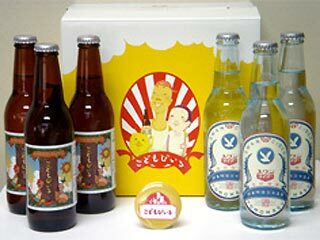 In honor (or in horror) of these bizarre beverages seemingly not fit to rinse your septic tank, raise a cracked glass to the Top Ten Bizarre Japanese Soft Drinks, our first ten inductees into the Soft Drink Hell of Fame... Jeers! Our rundown of the Top Ten Bizarre Japanese Soft Drinks gives a pretty good indication why most of the 1000 or so new soft drinks and beverages launched in Japan every year fail miserably. When American companies introduce products tailored for foreign tastes, we often experience discomfiting culture shock. Sort of like when Homer Simpson uses his toaster time machine to go back 10 million years, steps on a slug, and then comes back to an oddly different world. Maybe that really did happen, and Springfield is now Tokyo! Exhibit A: Pepsi Ice Cucumber, introduced to the Japanese soft drinks market and Pepsi vending machines on June 12th (2007) and to our Top Ten Bizarre Japanese Soft Drinks listing immediately thereafter. Pepsi? Good... Cucumbers? Great! Cucumber-flavored Pepsi? DOH!! Cue suave voiceover: "Next time you're out on the town with the one you love, treat her to a cup of Hot Calpis"... then trudge home alone after she pours it over your head. Yes, delicious Calpis - I can't even read it without grinning - is known as Calpico in other countries (for obvious reasons) and is one of Japan's most popular and enduring soft drinks . Milk-based with a sweet yogurt taste, Calpis comes in original and a variety of fruit flavors. Some drink vending machines offer this bizarre beverage hot... steaming hot. 8) Coolpis: Who wouldn't want to drink something with a name like Coolpis? Ahh, refreshing Coolpis... THE soft drink to offer guests - before removing their blindfolds. 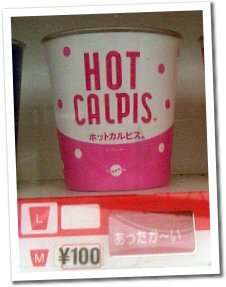 Actually a Korean copy of the disturbingly named Calpis, Coolpis comes in Peach flavor and (stop reading now, if you can...) Kimchee flavor. Kimchee, for those unacquainted, is a traditional Korean dish made from fermented cabbage and LOTS of red pepper. Makes Peach flavored Coolpis almost appealing, doesn't it? Anyone for a Calpis vs. Coolpis taste test? We could call it a pis-ing contest. 7) Mother's Milk: the breast-tasting drink ever! And now, for something close to the heart... Mother's Milk. Is there anything in the world more wholesome, more natural, more life-giving than mother's milk? Is there anything in the world that would make you drink it from a store bought carton? NO, on both counts. If I was a baby, maybe, but not from an udder - I mean, another - mother! I shudder to think of the scene inside one of the manufacturer's factories... those poor farmgirls, milkmaids or what have you, shackled up to cold, pitiless machines that never, ever stop... and then I woke up. After chugging down a pint of Mother's Milk, head on down to your local Black Vinegar Juice bar to give it a good curdling. Black vinegar is noted for its health benefits; the trouble has always been making it drinkable. Mixing it into bizarre soft drinks with soy milk, blood orange juice or blueberry juice is supposed to solve that problem, but we remain skeptical. At least you can splash some on the salad (via Plastic Bamboo). The creative types at Coca-Cola (yes, THAT Coca-Cola) who devised Water Salad are probably still shell-shocked from the New Coke and C2 soft drink fiascos and wouldn't risk another..or would they? 4) Diet Water: all the taste and none of the calories of regular water. Huh? And now, from the "selling ice to the Eskimos" department, we bring you Diet Water: the soft drink for the soft headed. "None of that rich, fattening Perrier for me, I'm serious about shedding pounds!" Not to mention shedding money. "Diet Water of the rich and famous"? We're not sure what the appeal of Diet Water is... maybe it has negative calories. Got a gamer at your house who lives, breathes and eats role-playing games like Final Fantasy? 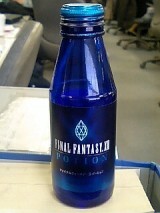 Now you can add "drinks" to the list, thanks to Final Fantasy Potion soft drinks. Let's see, at last count the stores were stocking Final Fantasy 13. BM Coffee - Nothing beats a good BM to start the day! BJ Coffee - I stand corrected. Deepresso Coffee - Is this the opposite of Espresso, or a coffee designed to bring down Type A personalities? Black Boss Coffee - Decaffeinated AND desegregated, for the equal opportunity executive suite. 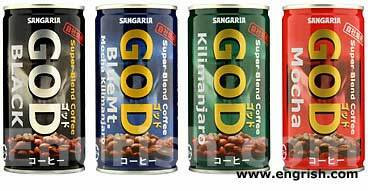 GOD Coffee - What does one serve with GOD Coffee? Communion wafers? We've saved the most bizarre drink for last... Kidsbeer. We kid you not: Kidsbeer. What can be said in defense of Kidsbeer, except maybe that it's alcohol-free? That would be like saying Hitler wasn't all bad because he liked dogs. Kidsbeer is so wrong on so many levels it makes my head spin, yet it is so popular in Japan that monthly shipments are approaching 100,000 bottles. As for the ad campaigns, nothing else will make you feel more like you've blundered into Superman's Bizarro world then seeing pre-teens - heck, pre-toddlers - joyfully guzzling their bottles of Kidsbeer. 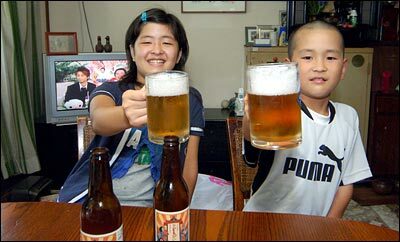 A little background: Kidsbeer used to be a normal, average soda called Guarana until 2003, when restaurant owner Yuichi Asaba renamed the bubbly brew "Kidsbeer" and watched sales go through the roof. Normally, some sort of government watchdog would step in at this point and read Asaba the riot act, but nope. Encouraged, Asaba farmed out production to the Tomomasu company, who made it less sweet, more frothy - more beer-like, if truth be told - and introduced brown bottles with labels resembling those of early Japanese beers. Still the government watchdog slept on (or maybe it's drunk and passed out), so naturally other beverage, soft drink and soda makers scrambled to get a piece of the near-beer action. Sangaria took one look at Kidsbeer's skyrocketing sales and decided to go one better: wine and sparkling wine for kids! Their product website is jaw-dropping in its audacity - and nicely done as well. Wanna be like mommy & daddy, kids? 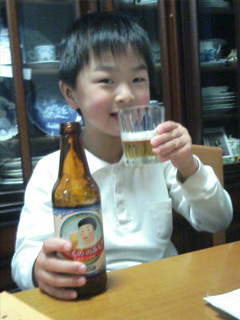 Drink Kidsbeer, the Little Prince of Beers! And that wraps up our list of the Top Ten Bizarre Japanese Soft Drinks, although we've saved up enough dishonorable mentions to form the better part of a follow-up list. Japan sure is a wonderful place, but it's far from home in more ways than just travel time. Barkeep, a frosty Kidsbeer for my friend - in a jelly glass! 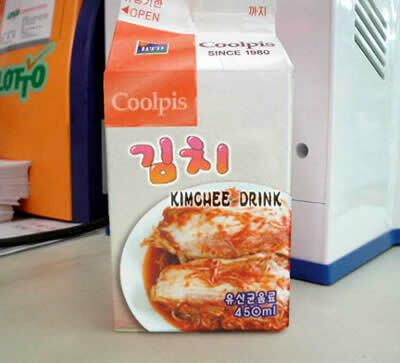 The Kimchee drink is Korean, or at least the writing on the package suggests so. So it says in the article, but since it's distributed in Japan you can still have that comparo with Calpis - if you dare! So obscene, numbers 1 through 5 have been obscured for our safety! Sorry about the glitch eith numbers 1 to 5. We had a slight mishap with the site this morning with some bad html coding. Can you believe that US children can drink Root BEER and Ginger ALE? Yes, we can. It's very popular in North America. Now where to get it.. I really want to order some of this stuff... Anybody have any idea how to? what site? 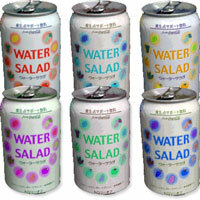 I gotta have me some water salad...what in the world could that taste like??? Whoa! Are you kidding me?!?! Whoa! Are you kidding me?!?! Like, It's SOOO like strange that they don't drink coca-cola, sprite, coffee, tea and ginger ale all over the world! - especially the non-english speaking countries! you've just blown my mind... yes I'm being sarcastic. 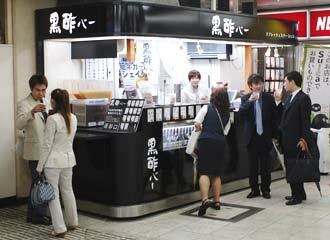 Welcome to century 20 - people in other countries like different things and don't necessarily blame beverages for the degeneration of their youth - which is why, I would hazard a guess in saying that the Japanese consumer watchdog saw nothing wrong with it. As an aside, the word "piss" does not necessarily translate to urine in Japanese. what are you going to find funny next? that they have words that sound like "f*ck you" in other languages dialects? grow a brain. The world does not revolve around the American market and yes, there are products out there with names that are not English based. And fix your blog to support line breaks for comments! This is probably like the Belgian brand Contrex. It's marketed as diet under the supposition that the particular blend of minerals it contains aids in weight loss. haha. laughing more at the douchebags that got upset than the actual drinks. They sell calpico around here, it's actually pretty good. I've had Monkey Fizz. It's grape soda. With a little vinegar. What we have here in Denmark is an low alcohol or alcohol free, very dark, very sweet beer called "hvidt øl" that is traditional around xmas, and normally also consumed by kids. I don't understand what's wrong with Kidsbeer. Here in Germany, we tend to drink beer - real beer - at the age of 6 already. The vile-sounding Asparagus Drink is weird in itself, that's for sure, but it's already been noted that i included a Korean drink (Coolpis) on the list even tho it's distributed in Japan. The Asparagas Drink comes from Taiwan. I assume you mean Pocari Sweat? At least in Korea that's what its called and it is quite good too. Bilk?? I guess "Meer" was already taken by the Russians, for their space station. Great blog, Laura! Kids can buy shandy.....it even has alcohol in it!!! How do they advertise it? It's the marketing campaign for Kidsbeer that struck me as even more bizarre than the drink itself. Shandy, Root Beer, & Ginger Ale all sound rather beer-ish but they don't sell themselves as, well, kid's beers. In Canada, a "shandy" is made with half a bottle of beer mixed with half a bottle of Ginger Ale - really good on a hot summer day! Oh man, by the time I got to Kidsbeer I was laughing so hard I was crying. Thanks for the great post! Not sure if Deepresso is the opposite of Expresso, but it may be the opposite of ESpresso!! Maybe check your own spelling and grammar before making fun. Well EX-cuuuuse me! And stop making fun of my spelling, lol!